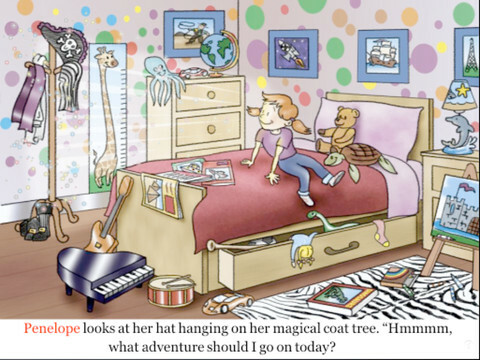 FREE for a limited time – Penelope HD, a delightful story for 4 – 8 year olds. It’s Penelope’s nap time but instead of napping she puts on a pirate hat and a magical thing happens. Her bedroom is transformed into a gigantic pirate ship and she becomes Penelope the Purple Pirate! She goes in search of treasure with her three friends: Daphne the dolphin, Teddy the sea turtle, and Oliver the octopus. This cute story also has a nice message about sharing. 🙂 After reading, there are 13 questions for discussion or to test your child’s recall. There are also suggested activities for the classroom/home. Ideas such as – have a treasure hunt or make a treasure test. The app also included fun facts about the featured animals and pirates. Nicely done!